Ever hear of the W.R. Titus Dolphin drawings from 1964? 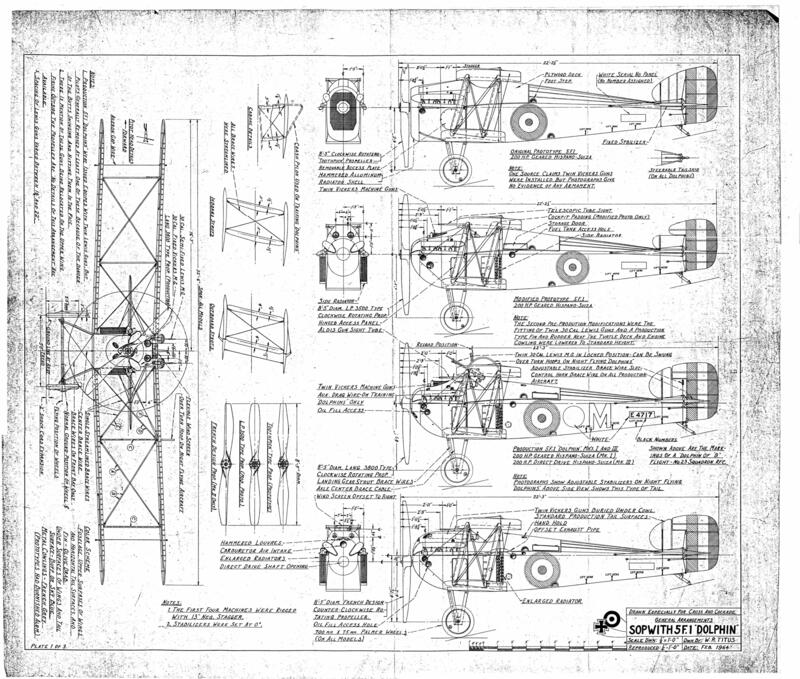 ...but I've got a full-size copy of the W.R. Titus drawn, THREE SHEET set of Sopwith Dolphin scale detail drawings, that I've been slowly scanning onto my hard disk, with six panels per sheet, and bringing each half-dozen set of JPEG-file format "tiles" together within my 64 bit CorelDRAW X7 bitmap/vector drawing environment to re-create EACH sheet from the set, to eventually place those up here as full-scale PDF files someday. As I've also got DesignCAD 3DMax v.25.2 on my PC (with version 26 just released), with an apparent capability for full-blown PDF output all on its own, I should easily be able to place each one of the three completed sheets, once all three are completed, each as a completed JPEG file, and pump out a PDF from the sheet without any other software title needed to complete a conversion to PDF for our needs. If I DID need a separate PDF-creating title to successfully achieve this, I'd be saving up to get a copy of FinePrint Software's "pdfFactory Pro" title, being a user of an earlier version of that firm's "pdfFactory" software some years ago. Just thought I'd let you know that I'm working on what could be a magnificent addition to what's available in this thread already...I had to work out a decent process to do the six-scans-per-sheet with for the W.R. Titus Sopwith Dolphin trio of drawing sheets, and thankfully, that sort of "stitching together" of multi-tile/panel drawings is something that I've found I've got QUITE a knack for doing, through using CorelDRAW and Corel Photo-Paint! ...enjoy, even though it's a fair bit fuzzy AND jumpy in spots...! REALLY looking forward to seeing some definitive Dolphin drawings! ...as my mom is nearing her 82nd birthday, and is now recuperating from her first-ever broken bone in her life (left tibia, broken early this month from a fall) I'm busy doing "intensified care-taking" lately to help her out, so getting back to the W.R. Titus-drawn Sopwith Dolphin plan-scans to share in this thread IS going to be a bit "understandably" delayed. Family first. The hobbies can wait. ...is a 200 dpi version of that first sheet...it is NOT YET scaled "properly" for a conversion to PDF, and I DO need to complete the scanning process for Sheets 2 & 3, before I can go any further on this set we'd all love to see.